Rare Fractures Linked To Drugs For Weak Bones Dr. Jennifer Schneider was one of the first women to suffer from an unusual fracture she believes was caused by osteoporosis drugs she'd taken for years. A new study confirms that women who've been on bisphosphonates more than five years have nearly three times higher risk of the unusual fractures. Dr. Jennifer Schneider was on a New York City subway when the train jolted and she shifted her weight onto her right leg. Suddenly, her thighbone snapped and she collapsed to the floor. "I could hear it and I could feel it," Schneider says. "I knew it was broken, instantly. I could not understand how this possibly could have happened from standing on a train." Dr. Jennifer Schneider works with patient Pam Nirenberg in Arizona. Schneider has led an effort to restrict the use of the bone drug Fosamax, saying extended use can lead to femur fractures like the one she had in 2001. Curiously, the break was not the usual kind of hip fracture associated with older bones. Those involve the ball-shaped head of the femur, or the narrow neck just below the head. 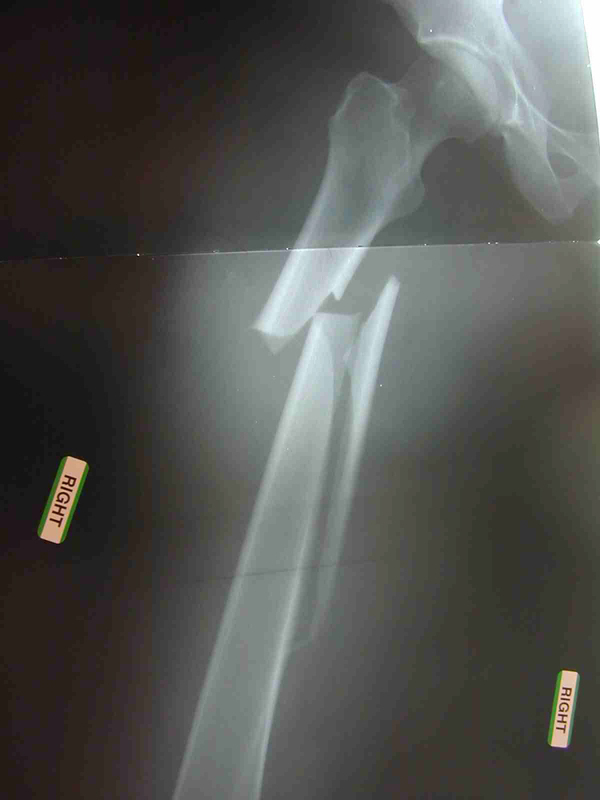 Schneider's fracture occurred farther down, just at the part of the femur that's usually the strongest. Schneider was one of the first women to suffer from one of these unusual fractures among patients who've been taking osteoporosis drugs called bisphosphonates for years. Or at least her case was one of the first reported in a medical journal, back in early 2006. Since then, orthopedic surgeons and bone specialists have been seeing more of these unusual fractures among long-term users of bisphosphonate drugs such as Fosamax, Actonel, Boniva and Reclast. There have been conflicting studies about the possible association between long-term use of such drugs and the risk of atypical fractures. The latest and largest study, a Canadian report published last week in the Journal of the American Medical Association, suggests that women who've been on bisphosphonates for more than five years have a nearly three times higher risk of the unusual fractures than those with only transient exposures to the drugs. "Although the number of fractures, these unusual fractures, was pretty small — they're pretty rare — (the study) nonetheless did show a relationship with longer-term use," says Dr. Gillian Hawker of St. Michael's Hospital in Toronto, an osteoporosis specialist and study author. The study found 716 atypical fractures among more than 200,000 Ontario women over 68. The researchers calculate the risk at one or two atypical fractures for every 1,000 women who took bisphosphonate drugs for more than five years. An X-ray of Schneider's right femur (thighbone), which broke suddenly as she was standing on a New York subway train. That's fairly rare, and considerably less than the risk of another potential side effect from these drugs, a condition called osteonecrosis of the jaw — the death of part of the jawbone, following a major dental procedure. Still, since tens of millions of women are taking bisphosphonates, the Ontario study suggests thousands of them may suffer devastating atypical fractures every year. But here's the dilemma: Many women really need these drugs, because they really do work to prevent ordinary hip fractures caused by osteoporosis. "Hip fracture is a horrible, horrible event — period," Hawker says. "It's very, very devastating, and often is an end-of-life event." Hawker, who's in her early 50s, points out that osteoporosis drugs have made an enormous difference for her mother's generation. "My mother and all my friends' mothers have horrible osteoporosis, multiple fractures, and that really is preventable in 2011," she says. "That's wonderful." But she goes on to make an important point: "In the heyday of the early days, when we all got excited about these medications, I think a lot of people who really probably didn't need to be on them went on them because [they had] very marginally reduced bone density." In other words, they had some evidence of bone thinning, sometimes called osteopenia, but they didn't have osteoporosis. Schneider, the doctor who broke her leg on the subway, says she's one of those. Like many women — and their doctors — Schneider thought she'd be better off if she started on an osteoporosis drug before she developed the actual disease. So she began taking Fosamax on the basis of a bone density scan that showed some thinning. Now she thinks that was a mistake. "We should not be so ready to put patients on these drugs as soon as their bone density starts dropping," says Schneider, who is a plaintiff in one of more than 150 lawsuits filed against Merck, the maker of Fosamax, involving atypical fractures. Merck declined to make an official available for an interview. The company said in a statement that it "does not believe that the JAMA publication establishes that those patients who take a bisphosphonate for any particular duration are at greater risk" for an atypical fracture. But a growing number of experts agree with Schneider that the risk of such fractures should discourage premature use of the drugs on the basis of bone density scans alone. "These kinds of fractures, which are uncommon but we've all seen them, raises this spectre that, 'Gee, we really need to rethink who we treat, when we treat, and how long we treat,' " says Dr. Clifford Rosen, a bone expert at Maine Medical Center in Portland. Rosen says there's evidence that five years on a bisphosphonate drug may be good enough. And taking a "holiday" at that point may not raise the risk of a regular osteoporosis fracture. He and other specialists encourage women and their doctors to use a Web calculator called FRAX that assess a patient's 10-year risk of a fracture. Some recommend that a patient not start taking a bisphosphonate drug unless her 10-year risk of hip fracture is at least 3 percent, and the risk of any fracture is at least 20 percent. Rosen says the take-home message is: Don't start one of these drugs too early; wait until you actually have osteoporosis. And once you start, don't stay on one of these drugs longer than necessary.